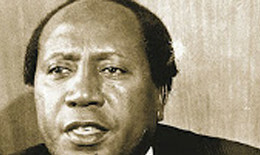 Robert J. Ouko (1931-1990) was a former politician who served as a Foreign Minister for Kenya from 1979 to 1983 and again from 1988 to 1990. Originally working as a teacher, he returned to university study economics, public administration and political science and upon graduating, began a career in politics. He initially worked as an Assistant Secretary in the office of the Governor before being promoted to Permanent Secretary in the Ministry of Works. Following the East African Community collapse in 1977, Mr Ouko became a member of Kenyan parliament and was eventually appointed to the position of Minister for Economic Planning and Community Affairs. His excellent economic work during this period saw him being promoted to the Minister of Foreign Affairs and International Cooperation as he sought to promote improve Kenya’s international presence.